Mark Pollard won again at Rookery Waters. Decoy Lakes, like most stillwaters, has been through a rough patch of late but it looks as if it’s coming back to life judging by the weekend’s improved results. In the Saturday Open fished on Six Islands and Four islands, Tony Evans came out on top with 60lb 9oz. He drew peg two on Four Islands and caught on the pole line on red maggot. In second place was Andrew Patton with 45lb 2oz from peg four on Four Islands followed by Danny Carlton on Six Islands peg 18 with 44lb 9oz. There was also a good turnout for the Sunday Open match which saw anglers lining the banks of the Beastie and Horseshoe pools. Leading the way in this one was Mick Fox. He had 64lb 12oz from hot peg 24 on the Beastie, catching well with the feeder and long pole with maggot. Nick Cooks came in second with 32lb 6oz followed by Tony Hobbs on 29lb 14oz. For round two of the Tony Evans Winter League at Decoy anglers were spread across the Willows, Six Islands and the Cedar pools. The leading weights saw a welcome return to something like the kind of form we have come to expect from this top fishery. Local rod Simon Godfrey drew well on Cedar peg five and proceeded to catch right from the off with red maggot and pellet on a long pole line to finish on 149lb 6oz. Adam Playford came in second. He weighed in 136lb 3oz, followed by Mark Goddard on 125lb and Gavin Butler with 71lb 8oz. 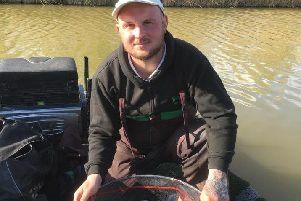 Over at Rookery Waters the winter qualifying open match fished on a frozen Magpie Pool saw fishery manager Alex Bates out early in the boat breaking the ice before anglers could even fish. The end result was a poor affair as even Mark Pollard found it tough going from one of the best pegs on the lake. He drew peg 34 and caught on the long pole line with bread and pellet for a modest 16lb 7oz. Runner-up was Kevin Peacock on peg one. He weighed in 13lb 14oz followed by Dave Adams with 10lb 5oz.